A piton is a metal pin that is hammered into a crack in the rock. It is described by its thickness, design, and length and provides a secure anchor for a rope that may be attached by a snaplink (Figure 2-38). There are four configurations used by the U.S. Army. They are the vertical, horizontal, wafer, and angle, which are made of either malleable or hardened steel, and alloys. The strength of the piton is determined more by its placement rather than its rated tensile strength. There are two types of pitons They are: blades that hold when wedged into tight-fitting cracks, and angles that hold blade compression when wedged into a crack. • Vertical pitons. The blade and eye are aligned. Vertical pitons are used in flush vertical cracks (Figure 2-39). • Horizontal pitons. 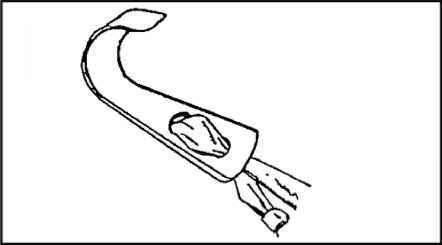 The eye of the piton is at right angles to the blade. 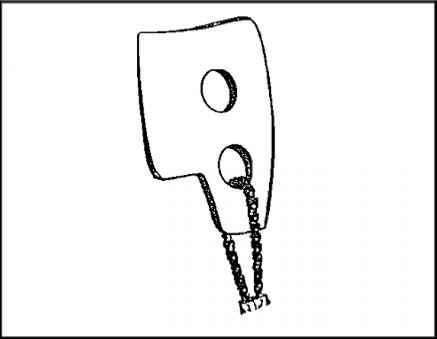 These pitons are used in flush horizontal cracks and in offset or open-book type vertical or horizontal cracks (Figure 2-40). They are recommended for use in place of vertical pitons in vertical cracks since the torque on the eye tends to wedge it into place, giving it more holding power than the vertical piton under the same circumstances. Wafer pitons. These are used in shallow, flush cracks They have little holding power and have their weakest points in the rings provided for the snaplinks. Knife blade pitons. These are used in direct-aid climbing They are small and fit into thin, shallow cracks. They have a tapered blade that is optimum for both strength and holding power. Realized Ultimate Reality Pitons (RURPs). These are hatchet-shaped pitons about 1-inch square. They are designed to bite into thin shallow cracks (Figure 2-41). • Angle pitons. These are used in wide cracks that are flush or offset (Figure 2-42). Maximum strength is attained only when the legs of the piton are in contact with opposite sides of the crack. • Bong pitons. These are angle pitons that are more than 3.8 cm (1A« inches) wide. Bongs are commonly made of steel or aluminum alloy and usually contain holes to reduce weight and accommodate snaplinks (Figure 2-43). They have a high holding power and require less hammering than other pitons. • Skyhook (cliffhangers). These are small hooks that cling to tiny rock protrusions, ledges, or flakes (Figure 2-44). Skyhooks require constant tension and are used in a downward pull direction. The curved end will not straighten under body weight. The base is designed to prevent rotation and aid stability. You should inspect and care for pitons at all times. Pitons may be reused many times by carefully retrieving them. They must be placed so that they do not bend backwards. They should be driven until only the eye protrudes, which is to a point where they are secure and provide the needed protection. Choosing the proper size and shape to fit the specific crack is key for emplacement and ease in retrieving. You should inspect pitons before, during, and after use to guarantee serviceability. Check the ends for "mushrooming" which is caused by continued pounding. Make sure the blades are straight and edges tapered. All rusted and chipped pitons should be filed and rubbed smooth. To protect them during storage, apply a light coat of oil. You should keep pitons dry during a climb. This hammer has a flat, steel head; a handle made of wood, metal, or fiberglass protected with tape; a blunt pick on the opposite side of the hammer; and a safety lanyard of nylon cord, webbing, or leather. The lanyard secures the hammer to the climber's body. • These hammers are used to drive and remove pitons, clean cracks, and pry objects loose. There are different types and sizes. You should choose one that will suit the intended use. The primary difference are in the design of the heads (Figure 2-45). • You should inspect the piton hammer for serviceability such as the head, pisk, handle, shaft, and lanyard. The hammers should be free of burrs, cracks, and rust. The head must be tight-fitting on the handle. When not in use, store the hammer in a clean, dry area. Conclusion: You have now completed the instructional material for Lesson 2. Before you complete the practice exercise for this lesson, you should review the material presented in this lesson. Answers and feedbacks for the questions in the practice exercise are provided to show you where further study is required. 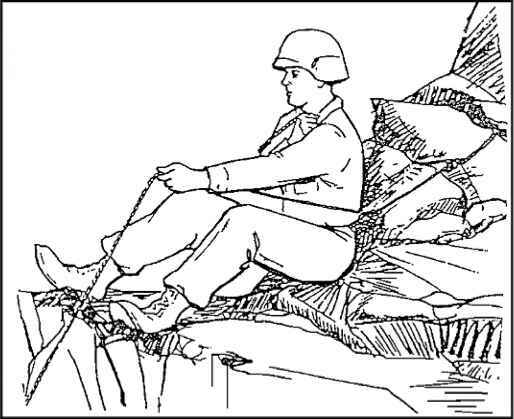 As a member of a unit participating in mountainous maneuvers, you are required to select climbing ropes and put them to use by selecting the appropriate knot(s) and snaplinks available to successfully complete the task assigned. 1. When your unit receives a standard military nylon-laid climbing rope, what characteristics will it have? a. 36 meters (120 feet) long and 11 millimeters (7/16 inch) wide with at least a 4,500-pound tensile strength. b. 25 meters (80 feet) long and 11 millimeters (7/16 inch) wide with at least a 4,500-pound tensile strength. c. 30 meters (90 feet) long and 11 millimeters (7/16 inch) wide with at least a 1,000-pound tensile strength. d. 26 meters (101 feet) long and 11 millimeters (7/16 inch) wide with at least an 8,000-pound tensile strength. 2. During the mountainous exercise you will be handling ropes. As a general rule, you should a. keep the rope clean, neatly coiled and stacked up on layers on the ground. b. keep the rope clean since dirt can damage a rope through abrasion. c. keep the rope clean by washing it with a mild bleach or fabric softener to avoid abrasions. d. wash the rope daily to eliminate excessive heat and to avoid weak fibers on the rope. 3. As a member of your unit, you have been designated to explain to the less experienced climbers the classes of knots used by all climbers. You know a. there are five classes to include joining knots, anchor knots, middle rope knots, fisherman knots, and special knots. b. there are only two classes, the joining and middle rope knots. c. these classes are only a general guide and they are joining, anchor, middle rope, and special knots. d. these classes are only a general guide and they are the joining and middle rope knots. 4. After tying a water knot, the first checkpoint you should check, is a. to make sure there are two round turns around the anchor with a locking bar. b. to make sure there are four overhand knots, two retracing the other two. c. to make sure there are four round turns around the anchor with a locking bar d. to make sure there are two overhand knots, one retracing the other. 5. You have been instructed by the leader of the climbing party to tie a clove hitch knot on a metal anchor. You should a. not use a clove hitch knot on metal, except on a picket hold fast. b. form a single, fixed loop in the middle of the rope. c. form two fixed loops at the end of the rope. d. form two fixed loops in the middle of the rope. 6. All snaplinks have basically the same characteristics. When using snaplinks, you should a. know that all snaplinks are made of steel with an oval shape. b. know that the weakest part of a snaplink is the gate, and it must be closed before applying a load. c. know that the heaviest and strongest snaplink is made of aluminum and copper. d. know that the nonlocking snaplinks are the best in the field since they are easy to operate. What is piton leather is it a coating? Can a rock climbing piton hammer be used as a rock pick hammer? How many type of piton?